Gili Trawangan is one of three beautiful islands on Gili Islands which located on the northwest corner of Lombok Island, West Nusa Tenggara, Indonesia. Gili Trawangan is the largest and the most popular among the three Gilis. You don’t have to worry about the accommodations because this island is the most developed than other Gilis. Just go to the south east of the island then you can find the most of the accommodations. Or if you like the quieter atmosphere, you can go to the north and south west cost of the island. SUN, PARTIES, and SEA. Three words to describe the tropical island, Gili Trawangan. This island is also called “Lost in Paradise” or “Party Island” because more adventurous backpacker types discover the islands and developed it into a hippy party paradise destination. You are the sun seeker types? 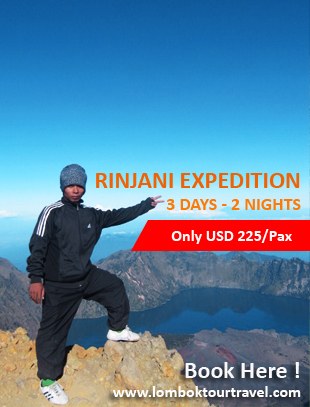 It offers you wonderful sunrises over Lombok’s Mount Rinjani volcano and spectacular sunsets that illuminate Bali’s towering Mount Agung volcano. All Gilis are no motorized transportation, so it is very nice to have fresh air. To go around this island, you can rent bicycles that can be rented hourly or daily or you prefer walk on foot that doesn’t cost money at all beside maybe you will little bit tired. You still have another alternative which only can be found on Gili Islands. That must be become unique and unforgettable experience. Yap, cidomos! The traditional transportation horse and carts that can be found easily all over the island. You don’t have to worry run out of money because this island has ATM machine that can be found at Hotel Vila Ombak and Coral Beach. All big hotels and dive centers accept visa and mastercard credit card. Need internet connection? Don’t worry, there are internet cafes that charge the same but may have different speeds. Don’t worry about the safety and health, because if you have any problems on the island you can report them to the Head of the Island at Satgas Office and there is new 24 clinic that can be found at Hotel Vila Ombak that has doctor and nurse on call that can deal with minor injuries and problems and can also prescription drugs. But, you have to remember to save the water because the fresh water is importing from the mainland Lombok, so water is expensive in here. Turtle hatchery is initiated by locals to help the turtle population around Gili Trawangan. This project relies on donations by locals and tourists that has grown bigger over the years. The poachers are paid for finding the turtles and they are re-buried and kept under surveillance. Once they hatch, the baby green and hawksbill turtles placed in the tank and left to grow until they are 6 months old. They can be released in to the sea when they are big enough to fend for themselves. Bio-Rock Project, is the project that initiated by Vila Ombak Diving Academy in 2004. This project is aim to encourage the re-growth of the coral using method called Bio-rock. In 2006, after the original project, all the dive operators came together to construct more Bio-rock structures. The 14 structures can be found in the shallower waters (5-6m) at different points in front of each dive shop.